Passive « Global Market Insights, Inc. 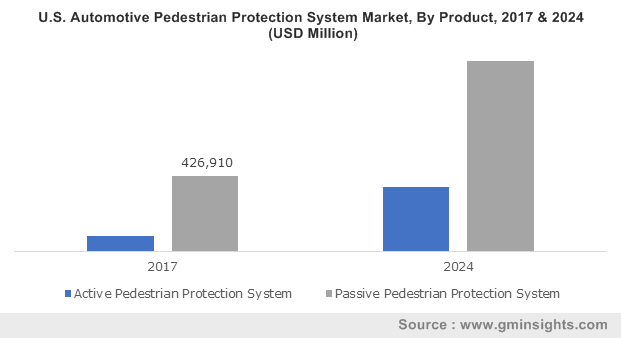 This entry was posted in Automotive & Transportation and tagged Active, Aftermarket, Automotive Pedestrian Protection System Market, Automotive Pedestrian Protection System Market Analysis, Automotive Pedestrian Protection System Market Report, Automotive Pedestrian Protection System Market Research, Automotive Pedestrian Protection System Market Share, Commercial Vehicles, Distribution Channel, Electric & Hybrid Vehicles, Global Automotive Pedestrian Protection System Market, OEM, Passenger Cars, Passive. Vehicle tracking market, in the recent years, has been traversing along a rather lucrative growth path mainly on the cusp of the technological advancements that have taken the automotive industry by storm. The rising need to monitor vehicle movement and the growing awareness regarding the benefits of vehicle tracking in terms of safety are regarded as the key drivers impelling vehicle tracking industry growth. According to reports, this business sphere has been drawing tremendous remuneration with a growing number of companies investing heavily in vehicle tracking systems to better position their business operations. Speaking of the commercialization potential of this business space, analysts deem that having drawn close to USD 6 billion in terms of revenue in 2016, global vehicle tracking market, quite undeniably is set to be a profitable growth ground for potential stakeholders. It has also been observed that in tandem with the core industry participants, the automakers and governmental bodies have been joining forces to develop products and simultaneously commence promotional campaigning programs to encourage the masses to adopt vehicle tracking systems. A very recent instance validating the authenticity of the aforementioned statement is that of the Roads and Transport Authority of Dubai mandating the installation of monitoring devices in all the brand new heavy vehicles that will be entering Dubai roads from the month of August. Reports reveal that the move comes on the heels of RTA’s expansion of its vehicle tracking program that will also include more heavy vehicles weighing 2.5 tons and above. The program further requires all the heavy 20-year-old trucks to have a vehicle tracking device installed to monitor over speeding, traffic accidents, driving in prohibited timing or places, sudden braking, reckless driving and over accelerating. Another significant instance depicting the involvement of government bodies in this business space is that of the Maharashtra local government body and Regional Transport Office (RTO) mandating the installation of intelligent transport systems that comprise panic buttons & a vehicle tracking system. According to reliable reports, more than 3.70 lakh existing vehicles will have to install these systems in the state – this would prove highly lucrative for the regional vehicle tracking industry. It is prudent to mention that the demand for numerous vehicle types has a pivotal role to play in augmenting the revenue graph of vehicle tracking market. Say for instance, heavy-commercial vehicles have lately been gaining massive traction in this business sphere. As per report in fact, vehicle tracking market share from the heavy-commercial vehicles is likely to register a y-o-y growth of 12% over 2017-2024. This robust growth can be credited to the growing demand for passenger & goods transportation coupled with rising consumer interest in tracking fleet performance. Further elaborating on the product trends, it has been observed that wired vehicle tracking systems are gaining considerable preference over their wireless counterparts. Analysts deem that the major factor contributing to the growth of wired vehicle tracking market is the cost effectiveness of the product over the wireless units. Moreover, perpetual innovations such as enhanced satellite view and mobile tracking have also been primarily fueling the product adoption, leading to vehicle tracking industry gaining renewed traction. With driverless and connected cars garnering mass momentum, vehicle tracking market is certain to amass extensive remuneration in the years to come, given that connected technologies are set to transform the way one commutes, interacts, and communicates with automobiles. Authentic sources in fact claim that the number of cars that will be equipped with embedded connectivity will rise by a whopping 300% over the next five years. In essence, the growing importance of security features and other advanced technologies that help reduce road accidents and fatalities are indeed likely to stimulate vehicle tracking industry share. It is estimated that by the end of 2024, the global vehicle tracking market will surpass USD 11 billion with more and more organizations beginning to dabble in this technology, taking advantage of the changing fleet management landscape. It is prudent to mention that despite the significant initiatives, there has been an ongoing debate regarding the installation of tracking systems. 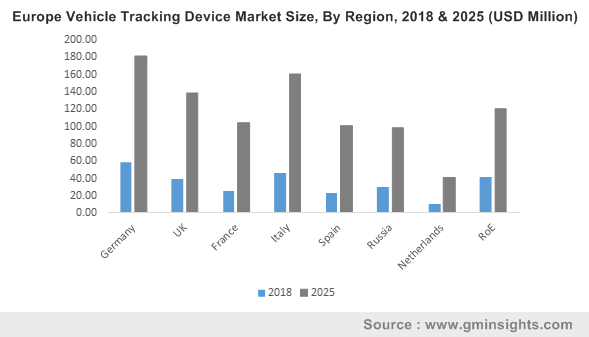 Nonetheless, vehicle tracking market has been expected to gain exceptional proceeds in the ensuing years, specifically due the contribution of regional governments. That apart, the escalating deployment of the product speaks for itself, and is deemed to push this business space to exceptional heights. As per estimates, vehicle tracking market size will increase at a CAGR of 7% over 2017-2024. This entry was posted in Automotive & Transportation and tagged Active, Construction, Fleet Management, HCV, LCV, Logistics, Passive, PCV, Private Cars, Two-Wheeler, Two-Wheeler Tracking, Vehicle Tracking Market, Vehicle Tracking Market Analysis, Vehicle Tracking Market Share, Vehicle Tracking Market Size, Wired, Wireless.